On to Group E, where the Dutch are hoping Arjen Robben’s injury isn’t so bad, keeping their trophy dream alive, while Denmark, Cameroon and even the Japanese are full of self belief they can be the team to join The Netherlands into the last 16. Things lookes so promising during the weekend route of Hungary, which ended 6-1. Then Robben went down, and the Dutch team suddenly doesn’t look THAT scary, despite it’s impressive play during the warm-ups. Bert van Marwijk has done a solid job with the team since taking over for Van Baasten, completing a perfect campaign in the qualifying group for South Africa. He has great wingers (Robben if regains health, Kuyt, Eljero Elia), great depth in the midfield (Sneijder, Van der Vaart, Van Bommel, De Jong) but a big question mark at goal (Stekelenburg’s form can be erratic) and at the center of defense (Heitinga, Mathijsen) and attack (Huntelaar’s horrible season with Milan). Van Persie will probably be the starter as a target man, but he doesn’t exactly feel perfectly comfortable as a lone striker. The Dutch do tend to attack in numbers and often with a lot of position switching so everything is very flexible up front. Will it be enough for a deep run? A dream for those who love “pretty” soccer, but usually, when people wake up to reality, The Netherlands fall along the way. They have the talent, but without defense it’s hard to win a tournament. Semi Finals Max. Another team that plays something of a flexible 4-3-3 but looks more like a 4-5-1 most of the time, Denmark surprised most during the qualifiers by beating Portugal and Sweden for the top spot in their group, with Soren Larsen scoring 5 goals and Bendtner adding 3. The team will go as far as Tomasson and Bendtner take them, with the Arsenal man playing in front of the veteran forward, Morten Olsen hoping for him to create his clutch time magic like he does for Arsenal. 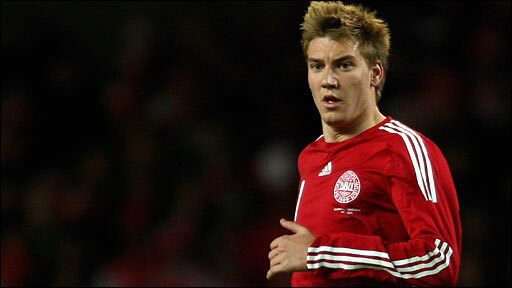 Still, Bendtner, despite his improvement in the last two season still has a long way to go before he reaches the world-class striker Wenger belives he can reach, and that may cause Denmark’s run to be a brief one. The midfield is an aging one, effective but not very flashy. Rommedahl, Jorgensen and the two Poulsens will need to do more than help the D and control the pace in order for Denmark to march on. The Danes, ever since the 1986 World Cup, are always fan favorites, but despite the underdog sympathy they receive, they lack quality in their side and need a transcendent team-effort to make it through. 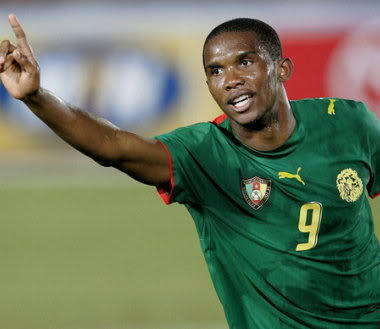 Welcome to the Samuel Eto’o show. Cameroon’s top scorer with 44 goals finished a not so great individual season with Inter (16 goals in 47 matches) but he did win the treble, so he’s coming in a good mood at least. Eto’o is the finisher, creator, target man and play-maker for Paul Le Guen’s side, which despite the 4-3-3 formation it presents, is actually more like a 1-10 kind of tactic. With a strong middle that has ton of physicality but lacks creativity, it’s all on Eto’o and Emana (probably playing as wingers) to feed the big man Idrissou in the middle. In the back? Cameroon have the fantastic Kameni at goal, but the Rigobert Song (fourth World Cup) led defense might be a bit sub-par when facing strong and fast opponents, exactly like the Dutch, the pacey Japanese or the Physical Danes. Japan has looked horrible during the warm up matches, scoring only once in their last five matches, and they still managed to lose that game (2-1 England). What’s good enough for the Asian qualifiers isn’t, except on home soil (2002 World Cup), enough for the big stage. Japan are still win-less in the World Cup besides the tournament they hosted 8 years ago. So what do Japan have upfront? Not much. Keiji Tamada has scored his last goal against a European team back in 2004, losing in a friendly to Hungary, and he’s the best they got, with Okazaki and Okubo also threatning on the sole striker position. 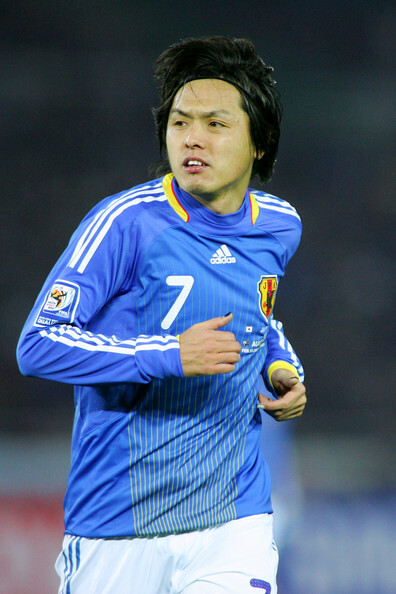 Japan’s best lies in it’s midfield, with the up and coming Keisuke Honda of CSKA Moscow, winning a lot of praise after his performance in the Champions League this season, Yasuhito Endo, another free kick specialist and probably the most versatile player on this team and Nakamura, but he seems to be fading away after leaving Celtic. Defense? Japan actually have a “bad-guy” in their back four, Tulio Tanaka, the best defender in Asia in the last four-five years and the man who broke Drogba’s arm. Despite his tough play and tendency to create havoc on the offensive side, he’s pretty much the only player in that D that’s is worthy of a place on a European side. Meaning? Japan don’t have, unless making a 200% effort by the whole team each game, coping with the offenses they’re going to face. Probably another win-less trip for Japan.